Set in Hawkins, Indiana during the 1980s, Stranger Things chronicles the search for a young boy who vanishes into thin air under highly suspicious circumstances. His mother opens an investigation into the boy’s disappearance with local authorities, unraveling a series of mysteries involving top-secret government experiments, terrifying supernatural forces and one very strange little girl. 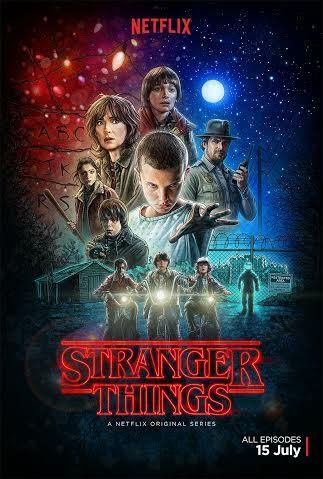 A love letter to the ubiquitous cult classics of the 80s, Stranger Things is also a coming of age story for the boy’s three closest friends that draws them into a world where mysteries lurk beneath the surface. ...Looks like a homage to the Spielberg films like E.T., Close Encounters of the Third Kind, and maybe some other films like The Goonies and Super 8 (which in itself was a homage to Spielberg) mixed in. All 8 episodes will be streamed on Netflix this July 15. Very Amblin-esque trailer & a nice Drew Struzan-style poster. And the casting of Winona Ryder is just great. I wonder if the 8 episodes will tell the complete story or is this planned as a Season 1? Already out yesterday. Got good reviews from critics. And although not yet greenlit, the plan is to continue the story to a Season 2. Saw the pilot, and thought it was awesome; they got all the 1983 details right--Dungeons & Dragons, hairstyles, fashion, music, and lots more, right to the fonts used for the credits with the dirty, grainy look. Only thing I didn't like was the side story of the annoying sister and her douchebag boyfriend. Watched until episode 4 --halfway through-- it's truly compelling, wanted to watch it until the end but I have to get up early; will finish the last 4 episodes tomorrow. Just finished it ... this series was amazing, every time each episode ended, I wanted more. Hope they do greenlight a second season. loving it! im halfway through the season. Binge-watched this. Can't help noticed that Mike looks more like a girl and El looks more of a boy. Me too. Episode 5 now. Galing how era accurate they are with everything. Loving the homages to Spielberg, Stephen King, Alien, Jim Henson, 80's slasher films, and so much more! Finished episode 8. Nice series. ...guaranteed to rock your world! 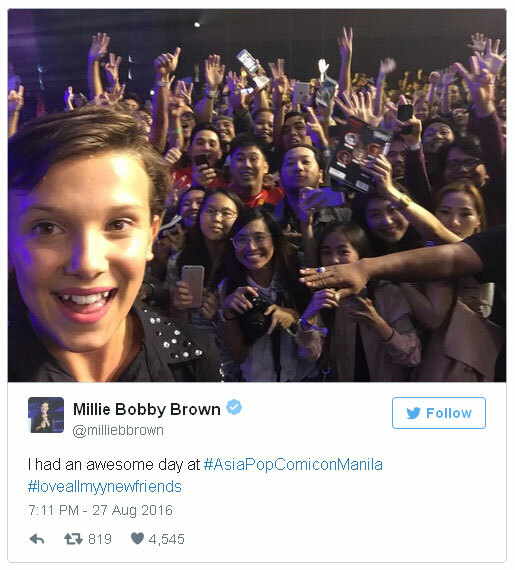 Millie Bobby Brown, who plays Eleven from raved Netflix series "Stranger Things," is one of the celebrity guests in this year's AsiaPOP Comicon Manila. I was gonna post that. Anyone gonna try and get her autograph? Anyway, I love this show. I'm PRAYING season 2 will be just as good if not better. These types of shows have the tendency to have a far inferior second season. Loved the first 7 episodes. Episode 8 kinda fell flat for me. Parang minadali yung conclusion. And a lot of things are still a mystery. Understandable naman since may season 2. The Upside Down world reminded me of Silent Hill. The monster even looked like one of the monsters from the game. You can have an autograph and/or photograph (taken only by the official photographer) with Millie Bobby Brown, but for a price. So far, APCC Manila has not announced the exact prices yet, but I'm guessing it will be in the range of US$ 30 to US$ 40 per autograph or photo. 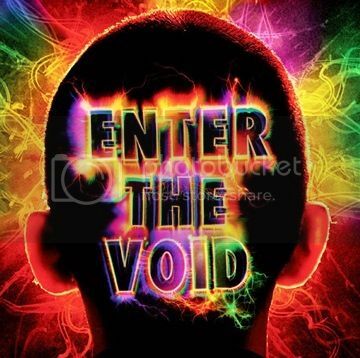 ayos to a. encounters, et, the thing, nightmare at elm street, the goonies, stand by me all rolled into one. dinagdagan pa ng the clash at joy division. what more to ask for? after watching sing street and everybody wants some this week, i'm convinced nasa 80s na tayo. We all dance by ourselves, that's why we only play electronic music. August 26 to 28, 2016 at the SMX MOA. ^ kasabay ng history con sa world trade! this was a very good show. scenes that made me smile were the bike chase and when they were walking on the train tracks. reminded me of e.t. and stand by me. love this series. very nostalgic! tama kayo, feels like an homage to all our '80s favorites: ET, Goonies, Firestarter etc. We would like to clarify that the tickets to Millie Bobby Brown's autograph, photograph, and meet-and-greet sessions are free, but slots are only limited and these have already been awarded to winners of Netflix's "Stranger Things" Facebook contest. You can still catch her on Saturday, August 27, 1:30pm, at the Main Stage, for "In Conversation with Millie Bobby Brown." Millie Bobby Brown can not only act well, she sings well too, and can even rap, Daming videos sa youtube. Talagang talented na bata. Even Aaron Paul of Breaking Bad is a big fan. Just finished season 1.. 8 great episodes..
Also, Sean Astin and Paul Reiser have been added to the cast for the 2nd Season.